CANTON, Mass. 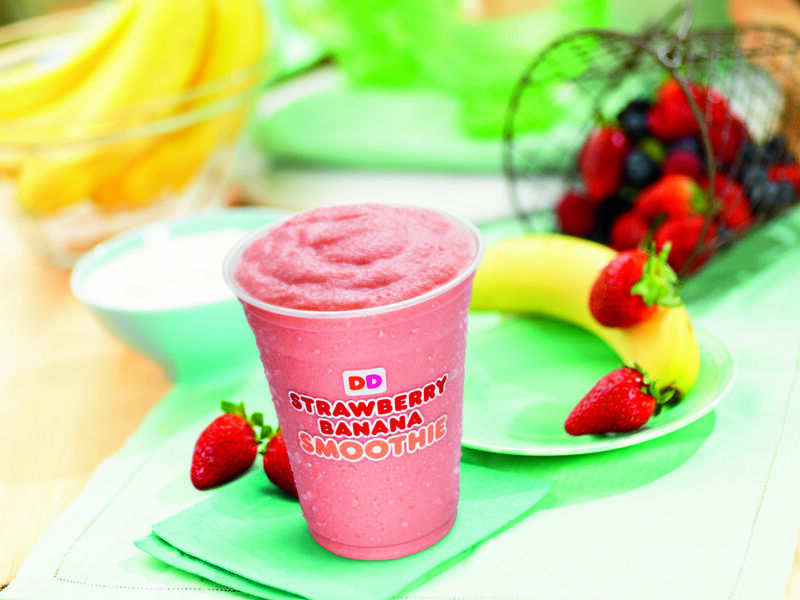 (February 3, 2015) – Dunkin’ Donuts today officially unveiled one of its most significant menu initiatives for 2015, announcing plans for a new beverage platform that will follow the installations of new blenders at Dunkin’ Donuts restaurants throughout the U.S. Dunkin’ Donuts new lineup of blended beverages will feature Smoothies made with real fruit and yogurt, Coolatta® Lite Frozen Beverages and Frozen Dunkaccino®. The new blended beverages will be introduced in select Dunkin’ Donuts restaurants in the Northeast beginning this month, and the products will gradually roll out nationwide at participating restaurants throughout the year. Fruit Smoothies: Dunkin’ Donuts will offer two varieties of freshly prepared Fruit Smoothies, Strawberry Banana and Tropical Mango. At 260 calories or less for a 16 oz. serving, both Smoothies are made with real fruit and creamy low-fat yogurt. Coolatta® Lite: A lighter version of Dunkin’ Donuts’ popular frozen Coolatta® beverages, the new Coolatta Lite varieties will give guests the opportunity to enjoy lower calorie versions, ranging from 33-80% fewer calories for a Frozen Coffee Coolatta, Frozen Caramel Coffee Coolatta, Frozen French Vanilla Coffee Coolatta, Frozen Hazelnut Coffee Coolatta, Minute Maid Orange Coolatta, Strawberry Coolatta and Vanilla Bean Coolatta. Frozen Dunkaccino®: A frozen version of Dunkin’ Donuts’ popular hot Dunkaccino®, the new Frozen Dunkaccino is an indulgent beverage with a unique blend of mocha and coffee flavors. Dunkin’ Donuts’ announcement of continued beverage innovation follows the 2014 introduction of its new Rainforest Alliance Certified™ Dark Roast Coffee, one of the boldest additions ever to the brand’s coffee lineup. Made with 30% Rainforest Alliance Certified™ beans, Dunkin’ Donuts’ Dark Roast Coffee uses a unique roasting process to create a bold flavor and smooth finish without the bitterness typically associated with most dark roast coffees. In April 2014, the brand also launched Iced Green Tea featuring the Rainforest Alliance Certified™ seal. As part of the brand’s commitment to menu innovation, Dunkin’ Donuts last year also introduced Croissant Donuts, Almond Milk, Go Bar Chewy Granola Bars and more. Dunkin’ Donuts also launched its DD Perks® Rewards Program, offering guests points toward free Dunkin’ Donuts beverages with every qualifying purchase, along with a free beverage of any size upon registering and on the member’s birthday.